On September 12, 1964, a month prior to the opening of the 1964 Tokyo Olympics, the Mainichi Daily News published the last of a 15-part UPI series entitled, “Great Cities of the World”. The article was entitled “Rio: The City of Marching For Tomorrow”, a meaningless title really. The theme was a familiar one for emerging markets at the time: a fascinating city in a far-off land that was growing rapidly into prominence. Below are a few of the highlights from that article about the city of Rio de Janeiro that provide us with hints to what has changed, and what has not over the past 52 years. Corruption: “Rio is still Brazil’s center of political intrigue and corruption.” The article goes on to state that the laws are made in the recently established government seat, Brasilia, but that “the deals are made in elegant Copacabana Beach apartments owned by leading politicians, or by their mistresses, distant relatives or front men.” For sure, this is still true. Industry: “Rio, outside the big coffee-and-automobile complex of Sao Paulo, has managed to win a positions in the textile, food processing and electronics industries.” Coffee and cars are still big exports for Brazil, as are textiles, electronics, aircraft, iron ore and orange juice. Umbanda: “Umbanda claims 30,000 followers in Rio, but the signs would indicate more.” This uniquely Brazilian religion, a fusion of Roman Catholicism, African traditions, and indigenous American beliefs, is still a viable religion, with estimates of 400,000 followers in Brazil, with many of them likely in Rio. 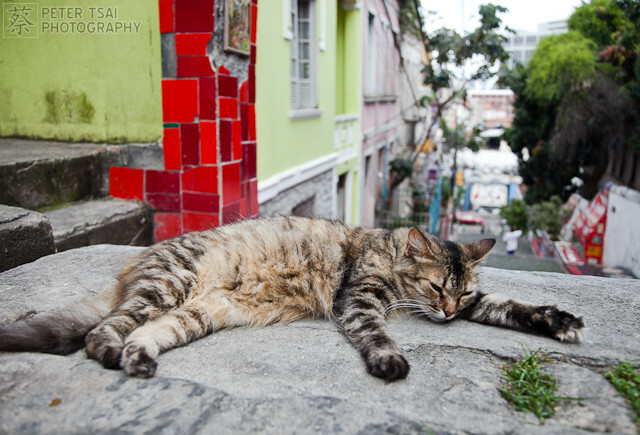 Feral Cats: “No reformer has yet suggested doing away with Rio’s half-wild stray cats, numbering countless thousands, which dominate every park, alley and quiet street and no one is likely to attack them. A lot of Cariocas believe cats have ‘the souls of people. '” Rio, apparently, is still a cat haven. Population: The population in 1964 was 3million. Today, Rio is creaking with a population over 11 million. Maracana Stadium: Rio still goes crazy for soccer and plays big games in the Maracana Stadium. However, back in 1964, the stadium held an astounding 230,000 people. After the stadium was renovated and re-opened in 2013, it now seats 78,000. Guanabara Bay: “The sparkling blue beauty of Guanabara Bay…”: That certainly isn’t a phrase bandied about these days. Posted in Business, Environment, Pop Culture, Rio Olympics, Soccer, Tourism and tagged Brazil, Christ the Redeemer, corruption, feral cats, Guanabara Bay, Maracana Stadium, Rio de Janeiro, The Mainichi Daily News, Umbanda. Bookmark the permalink.